Boron nitride (BN) is a well-known ceramic material with fascinating properties, such as low density, high melting point, strength, corrosion resistance, and good chemical stability, excellent electrical and thermal properties. These properties make boron nitride a promising material for a wide range of industrial applications, especially for its uses under extreme high temperature conditions [1-3]. The BN originally exists in several crystal structures such as wurtzite BN (w-BN), cubic BN (c-BN), rhombohedral BN (r-BN), hexagonal BN (h-BN), explosive BN (e-BN), and turbostratic BN (t-BN). The c-BN and w-BN are especially known for super-hardness, wide band gap and its oxidation resistance which makes them a promising material for fabrication of cutting tools, protective coatings, and optoelectronic devices [4,5]. Nevertheless, the h-BN has similar crystal structure to graphite hence it is also known as white graphite [6,7]. This crystal structure provides the outstanding lubricating properties, high thermal conductivity, electrical resistance and low dielectric constant [4,8,9]. Recently, BN is synthesized with various morphologies, such as hollow spheres , porous structures , and one-dimensional nanostructures to obtained excellent properties [12,13]. The porous BN has gain significant attention due to its high specific surface area, which makes it a promising material for catalytic action. The porous BN has been synthesized by using various methods such as molecular precursors, and supercritical drying method etc [14-17]. However, all these methods require either special precursor or high temperature conditions to modulate the specific surface area and crystal structure. In physics, the energy is considered as the ability to do work; which fundamentally interrelates with matter as E=mc2 (Einstein’s famous equation). However the energy can be considered as a field of force which effectively interacts with any matter at a distance and cause action. Researchers have confirmed that biomagnetic fields are present around human body, which have been evidenced by electromyography (EMG), electrocardiography (ECG) and electroencephalogram (EEG) . Scientists have postulated that it is due to the flow of bioelectricity (generated from heart, brain functions or due to the motion of charged particles such as protons, electrons, and ions) in the human body. As per the basic fundamental law in physics, when an electrical signal passes through any material, a magnetic field is generated in the surrounding space. Hence, a magnetic field is created along with the bioelectricity in human body, known as biomagnetic field. The cumulative field created by bioelectricity and biomagnetic field, which surrounding the human body is known as biofield. The energy associated with this field is considered as biofield energy. Mr. Mahendra K Trivedi’s biofield has known to alter the characteristics in various things at atomic, molecular and physical level in many fields such as material science [19-26], microbiology [27-29], biotechnology [30,31] and agriculture [32-34]. The biofield treatment has also shown significant results in graphite carbon, for instance, the unit cell volume was decrease by 1% and crystallite size was increased by 100% after treatment . In the present study, we report for the first time, an impact of biofield treatment on BN powder for its structural properties along with atomic and physical properties. The BN powder was purchased from Sigma Aldrich, USA. 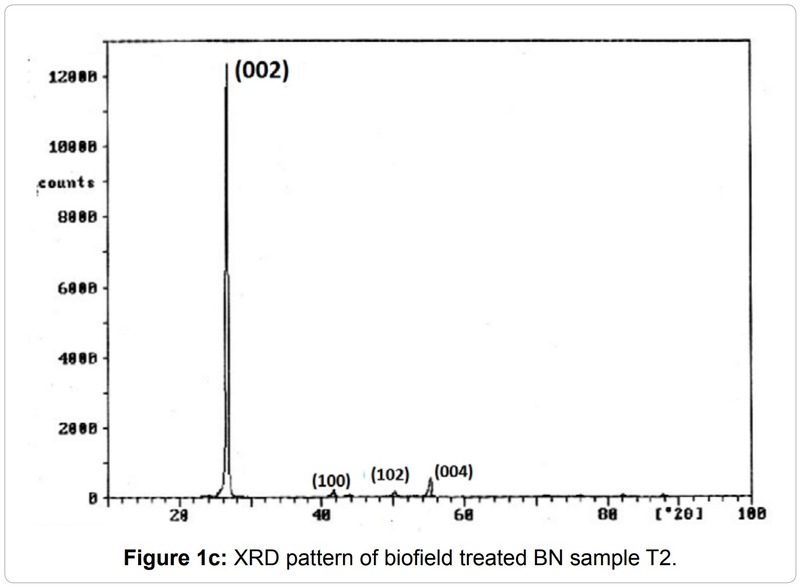 The sample was equally divided into two parts, one part was considered as control and other part was exposed to Mr. Trivedi’s biofield, herein referred as biofield treatment. 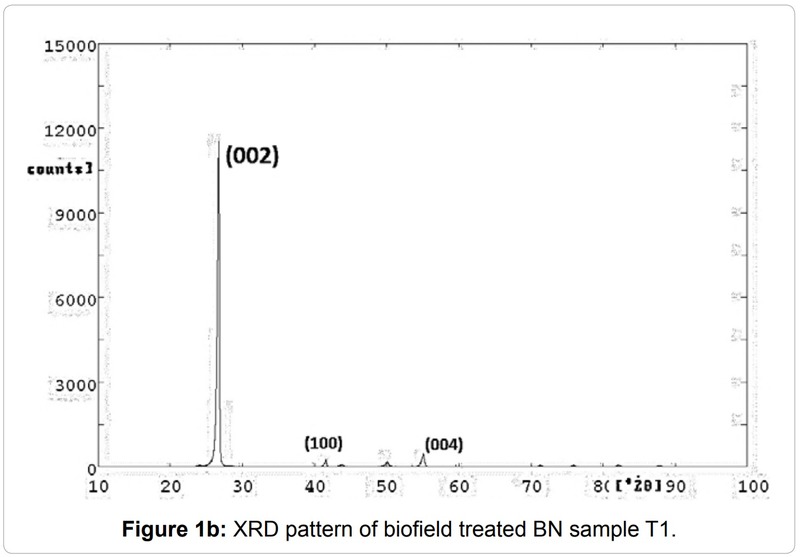 The control and treated samples were characterized using X-ray Diffraction (XRD), surface area analyzer, and Fourier transform infrared (FT-IR) spectroscopy. For X-ray diffraction study the treated sample was divided into four parts, coded as T1, T2, T3, and T4 respectively. 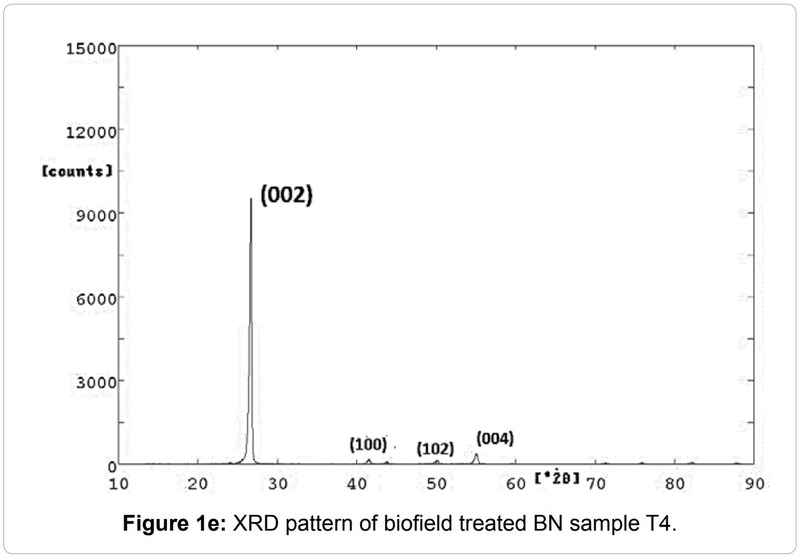 The XRD analysis was performed on X-ray diffractometer Phillips, Holland PW 1710 system with a copper anode with nickel filter and wavelength of radiation of 1.54056 Å. The data provided by XRD system was in the form of a chart of 2θ vs. intensity and a table containing peak intensity counts, d value (Å), peak width (θ°), and relative intensity (%) etc. For computing lattice parameter and unit cell volume, PowderX software was used. Where ac and at are lattice parameter of control and treated powder samples respectively. The percentage change in all other parameters such as unit cell volume, density, and crystallite size was calculated in a similar manner. The surface area was characterized using surface area analyzer, SMART SORB 90 BET, which had a detection range of 0.1–1000 m2/g. 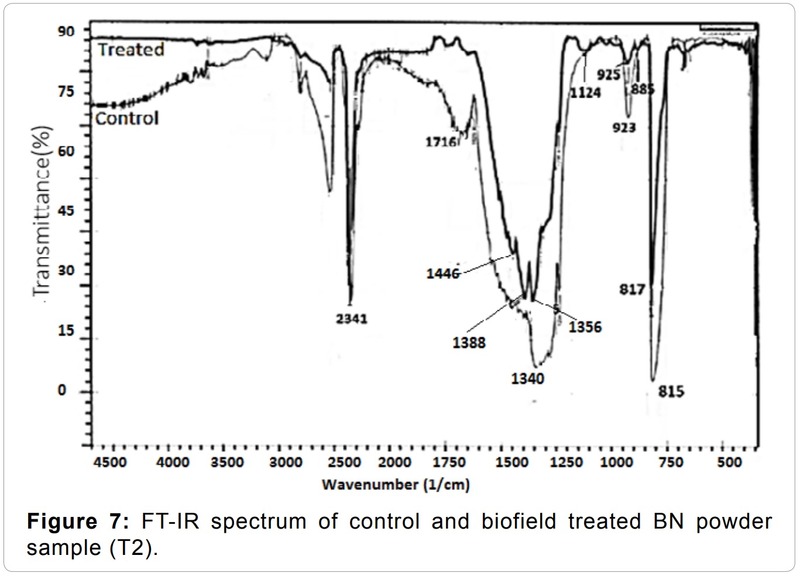 FT-IR analysis of control and treated samples T1, T2 was carried out on Shimadzu, Fourier transform infrared (FT-IR) spectrometer with frequency range of 300–4000/cm. molecular weight and crystallite size, which are presented in Table 1. 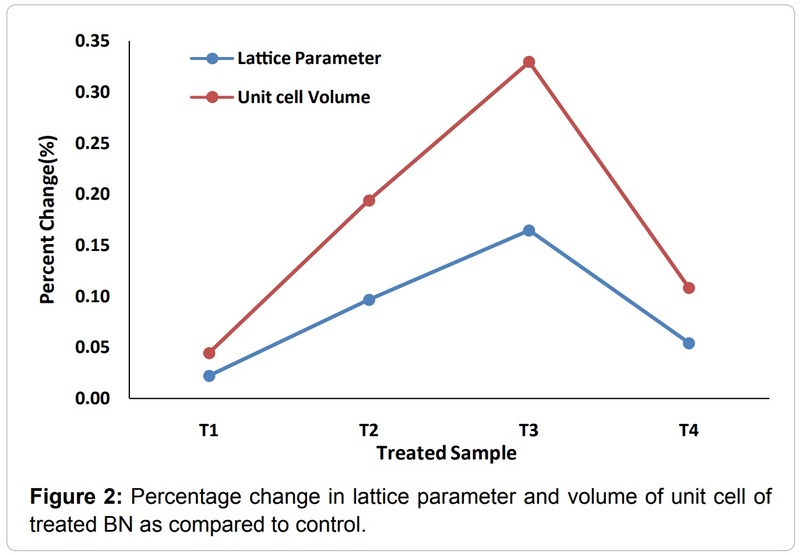 It was found that the lattice parameter of the unit cell was increased in treated sample T2 by 0.16% after treatment (Figure 2) as compared to control. A positive lattice strain in treated BN samples indicated that a tensile stress may be applied over the unit cell . This may led to increase the unit cell volume by 0.33% and reduced density by 0.33% in treated BN samples as compared to control. 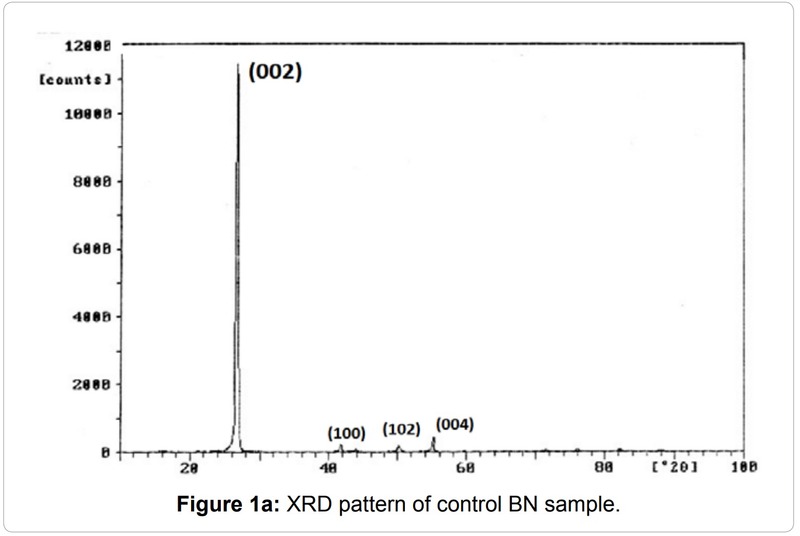 Table 1: X-ray diffraction (XRD) of lattice parameter, unit cell volume, density, molecular weight and crystallite size of BN sample. BN, the electron cloud, around the nucleus moved away from the centre that may led to increased atomic size . Consequently, the increased atomic size may reduce the nuclear charge per unit volume. 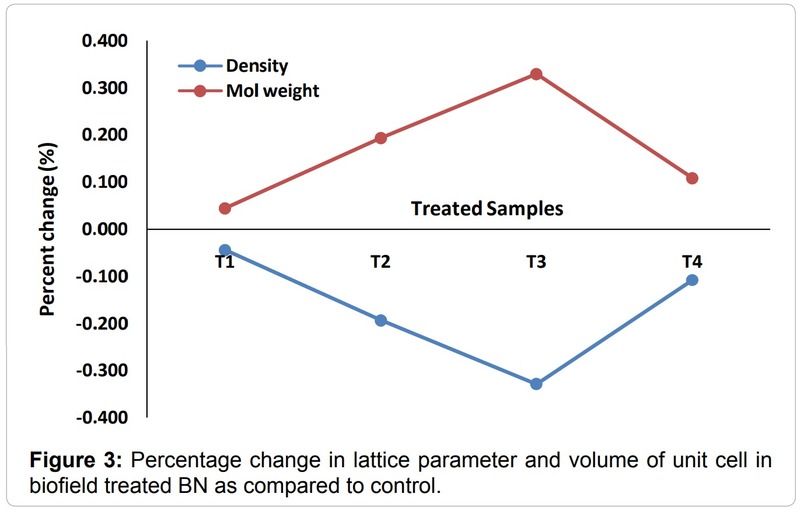 Furthermore, it was observed that the molecular weight in treated BN samples were increased up to 0.33% as compared to control (Figure 3). The reduction in nuclear charge per unit volume and increased molecular weight suggested that the number of protons were probably decreased in treated BN powder. It can be possible only when protons are participating in reversible weak nuclear reactions giving rise to neutrinos and neutrons [21-23,36]. 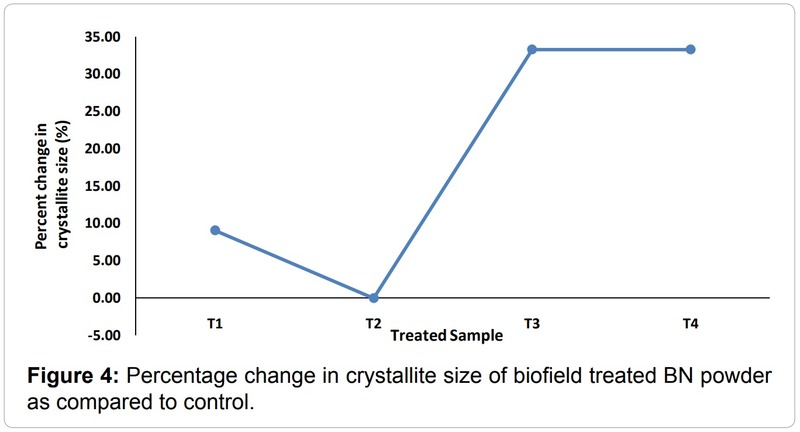 Additionally, it was found that the crystallite size was increased up to 33.30% in treated BN sample as compared to control (Figure 4). It is possible that the internal strains present in treated BN powder made dislocations to move unhindered that results into reorient the planes on either side of the crystallite boundaries. Further, this reorientation of planes may led to increase the crystallite size . Al-Jawhari reported that the crystallite size have direct relationship with dielectric constant . Moreover, the dependence of dielectric constant on the crystallite size has been reported by researchers on other materials such as diamond, TiO2 and Bi2O3, where it was mentioned that dielectric constant increases as crystallite size increases [37-39]. Thus, it is hypothesized that the biofield treatment may enhance the dielectric constant of BN powder. 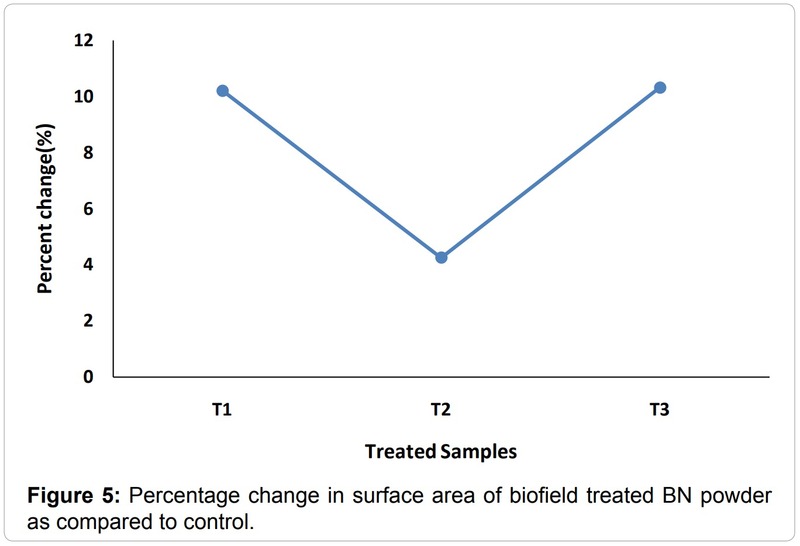 Table 2: Surface area of control and treated BN samples. the particle surface through surface grinding and internal friction. Hence, this higher porosity may result in large surface area in treated BN powder as compared to control [15,16]. Moreover, this increased surface area would be helpful to confer better performance during catalytic applications. spectrum of control sample showed an absorption peak at around 1340/cm and interestingly two peaks were found at 1388/cm and 1356/cm in treated sample (T2). The emergence of new absorption peak at 1388/cm could be due to the presence of r-BN . It is postulated that the h-BN unit cell was distorted to form r-BN unit cell, which may be due to applied tensile stress during high energy milling through biofield treatment. Based on these results, it is assumed that, biofield treatment could be an alternative technique to modulate the physical and atomic characteristic in BN powder for optoelectronic and chemical industries. Present study, concludes that the biofield treatment has significantly changed the atomic and crystal structural characteristics of BN powder. 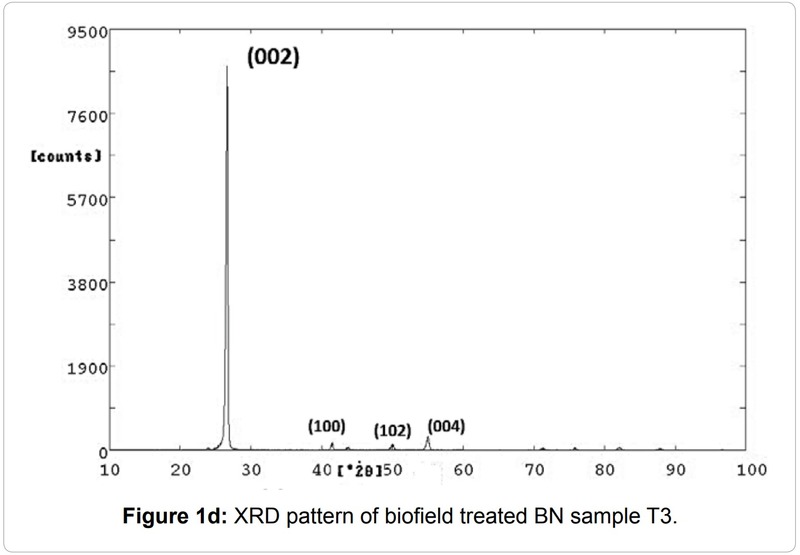 XRD data confirmed that the crystallite size was significantly increased up to 33.3% in treated BN powder as compared to control, which may directly increase the dielectric constant. 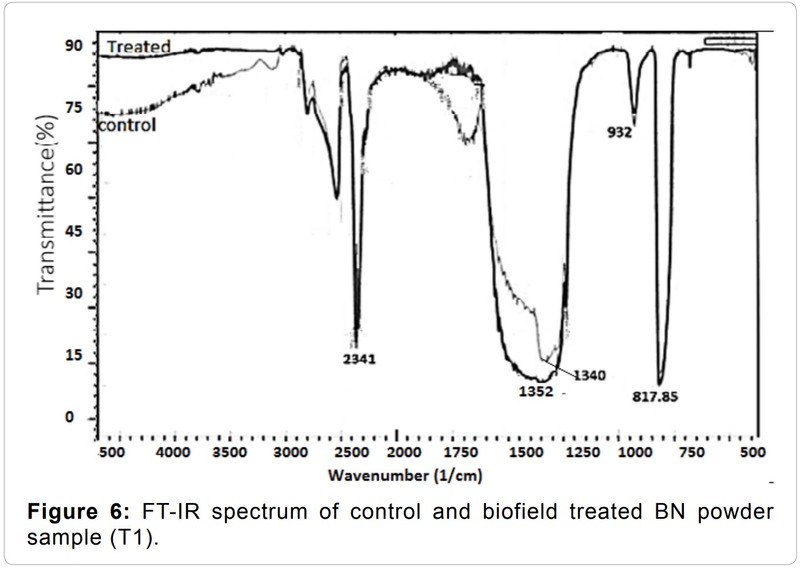 Furthermore, the FT-IR results revealed that h-BN crystal structure may be transformed into r-BN after biofield treatment. The higher surface area in treated BN was found as compared to control, indicating that it could be more useful during the catalytic reaction. Based on these promising results, it is expected that biofield treatment could be applied to improve the catalytic and optoelectronic properties of BN powder. Authors gratefully acknowledged to Dr. Cheng Dong of NLSC, Institute of Physics, and Chinese academy of Sciences for providing the facilities to use PowderX software for analyzing XRD data. 1. Paine RT, Narula CK (1990) Synthetic routes to boron nitride. Chem Rev 90: 73-91. 2. Watanabe K, Taniguchi T, Kanda H (2004) Direct-bandgap properties and evidence for ultraviolet lasing of hexagonal boron nitride single crystal. Nature Mater 3: 404-409. 3. Mirkarimi PB, McCarty KF, Medlin DL (1997) Review of advances in cubic boron nitride film synthesis. Mater Sci Eng Rep 21: 47-100. 4. Shi X, Wang S, Yang H, Duan X, Dong X (2008) Fabrication and characterization of hexagonal boron nitride nanopowder by spray drying and calcining-nitriding technology. J Solid State Chem 181: 2274-2278. 5. Lian G, Zhang X, Zhu L, Tan M, Cui D, et al. (2010) New strategies for selectively synthesizing cubic boron nitride in hydrothermal. Cryst Eng Comm 12: 1159-1163. 6. Bindal MM, Singh BP, Singhal SK, Nayar RK, Chopra R (1994) High pressure phase transformations in turbostratic boron nitride using magnesium boron nitride as the catalyst. Cryst Growth 144: 97-102. 7. Gladkaya IS, Kremkova GN, Slesarev VN (1986) Turbostratic boron nitride (BNt) under high pressures and temperatures. J Less Common Met 117: 241-245. 8. Laurence Vel L, Demazeau G, Etourneau J (1991) Cubic boron nitride: synthesis, physicochemical properties and applications. Mater Sci Eng B 10: 149-164. 9. Soma T, Sawaoka A, Saito S (1974) Characterization of wurtzite type boron nitride synthesized by shock compression. Mater Res Bull 9: 755-762. 10. Chen LY, Gu YL, Shi L, Yang ZH, Ma JH, et al. (2004) A room-temperature approach to boron nitride hollow spheres. Solid State Comm 130: 537-540. 11. Dibandjo P, Chassagneux F, Bois L, Sigala C, Miele P (2006) Synthesis of boron nitride with a cubic mesostructure. Micropor Mesopor Mater 92: 286-291. 12. Mickelson W, Aloni S, Han WQ, Cumings J, Zettl A (2003) Packing C60 in boron nitride nanotubes. Science 300: 467-469. 13. Deepak FL, Vinod CP, Mukhopadhyay K, Govindaraj A, Rao CNR (2002) Boron nitride nanotubes and nanowires. Chem Phys Lett 353: 345-352. 14. Lindquist DA, Smith DM, Datye AK, Johnston GP, Borek TT, et al. (1990) Boron nitride and composite aerogels from borazine-based polymers. Mater Res Soc Symp Proc 180: 1029-1034. 15. Dibandjo P, Bois L, Chassagneux F, Cornu D, Letoffe JM, et al. (2005) Synthesis of boron nitride with ordered mesostructure. Adv Mater 17: 571-574. 16. Borovinskaya IP, Bunin VA, Merzhanov AG (1997) Self-propagating high-temperature synthesis of highly porous boron nitride. Mendeleev Comm 7: 47-48. 17. Perdigon-Melon JA, Auroux A, Guimon C, Bonnetot B (2004) Micrometric BN nanopowders used as catalyst support: Influence of the precursor on the properties of the BN ceramic. J Solid State Chem 177: 609-615. 18. Zahra M, Farsi M (2009) Biofield therapies: Biophysical basis and biological regulations. Complement Ther Clin Pract 15: 35-37. 19. Trivedi MK, Tallapragada RM (2008) A transcendental to changing metal powder characteristics. Met Powder Rep 63: 22-28, 31. 20. Trivedi MK, Tallapragada RM (2009) Effect of superconsciousness external energy on atomic, crystalline and powder characteristics of carbon allotrope powders. Mater Res Innov 13: 473-480. 21. Dhabade VV, Tallapragada RM, Trivedi MK (2009) Effect of external energy on atomic, crystalline and powder characteristics of antimony and bismuth powders. Bull Mater Sci 32: 471-479. 22. Trivedi MK, Patil S, Tallapragada RM (2012) Thought intervention through bio field changing metal powder characteristics experiments on powder characteristics at a PM plant. Future Control and Automation 173: 247-252. 23. Trivedi MK, Patil S, Tallapragada RM (2013) Effect of biofield treatment on the physical and thermal characteristics of silicon, tin and lead powders. J Material Sci Eng 2: 1-7. 25. Trivedi MK, Patil S, Tallapragada RM (2014) Atomic, crystalline and powder characteristics of treated zirconia and silica powders. J Material Sci Eng 3: 144. 26. Trivedi MK, Patil S, Tallapragada RM (2015) Effect of biofield treatment on the physical and thermal characteristics of aluminium powders. Ind Eng Manage 4: 151. 27. Trivedi MK, Patil S, Bhardwaj Y (2008) Impact of an external energy on Staphylococcus epidermis [ATCC -13518] in relation to antibiotic susceptibility and biochemical reactions - An experimental study. J Accord Integr Med 4: 230-235. 28. Trivedi MK, Patil S (2008) Impact of an external energy on Yersinia enterocolitica [ATCC -23715] in relation to antibiotic susceptibility and biochemical reactions: An experimental study. Internet J Alternat Med 6. 29. Trivedi MK, Patil S, Bhardwaj Y (2009) Impact of an external energy on Enterococcus faecalis [ATCC-51299] in relation to antibiotic susceptibility and biochemical reactions-An experimental study. J Accord Integr Med 5: 119-130. 30. Patil S, Nayak GB, Barve SS, Tembe RP, Khan RR (2012) Impact of biofield treatment on growth and anatomical characteristics of Pogostemon cablin (Benth). Biotechnology 11: 154-162. 31. Altekar N, Nayak G (2015) Effect of biofield treatment on plant growth and adaptation. J Environ Health Sci 1: 1-9. 32. Shinde V, Sances F, Patil S, Spence A (2012) Impact of biofield treatment on growth and yield of lettuce and tomato. Aust J Basic Appl Sci 6: 100-105. 33. Lenssen AW (2013) Biofield and fungicide seed treatment influences on soybean productivity, seed quality and weed community. Agricultural Journal 8: 138-143. 34. Sances F, Flora E, Patil S, Spence A, Shinde V (2013) Impact of biofield treatment on ginseng and organic blueberry yield. AGRIVITA J Agric Sci 35. 35. Aradi E, Naidoo SR, Billing DG, Wamwangi D, Motochi I, et al. (2014) Ion beam modification of the structure and properties of hexagonal boron nitride: An infrared and X-ray diffraction study. Nucl Instr Meth Phys Res B 331: 140-143. 36. Narlikar JV (1993) Introduction to cosmology. Jones and Bartlett Inc., Cambridge University Press. 37. Al-Jawhari HA, Baeraky TA, Afandi YH (2011) The influence of microwave frequencies at high temperatures on structural properties of h-BN. Intl J Eng Technol 11: 63-66. 38. Ye H, Sun CQ, Hing P (2000) Control of grain size and size effect on the dielectric constant of diamond films. Appl Phys 33: L148-L152. 39. Pamu D, Sudheendran K, Krishna M, Raju KCJ, Bhatnagar AK (2007) Microwave dielectric behavior of nanocrystalline titanium dioxide thin films. Vacuum 81: 686-694. 40. Mirkarimi PB, McCarty KF, Medlin DL (1997) Review of advances in cubic boron nitride film synthesis. Mater Sci Eng R 21: 47-100.